I'm not sure who I should be more disappointed in- Mozilla or Debian. Iceweasel 43 recently arrived in Debian unstable, and with it, Pocket. For those who are not familiar, Pocket is a 3rd party service that allows users to save sites they want to read or visit for later. Provided the extension is installed, this allows users to sync pages they want to read for later, across devices and platforms. But here's the catch: it's a proprietary non-free service-as-a-software-substitue (SaSS). Thankfully, you can disable it, and it really isn't that difficult. 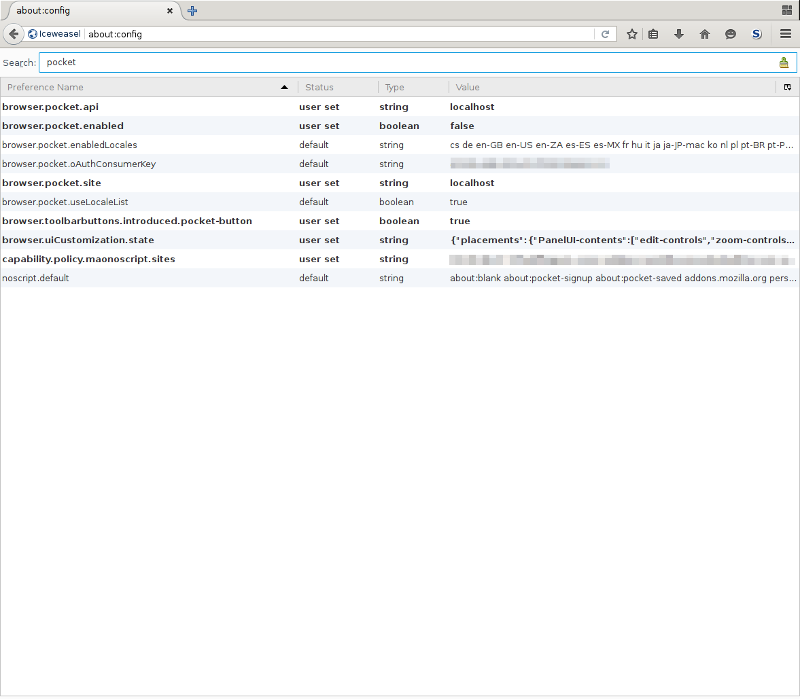 Open up about:config in a new tab, and type "pocket" into the search filter. From there, set "browser.pocket.api" and "browser.pocket.site" to "localhost", and set "browser.pocket.enabled" to "false", then restart your browser. It really bothers me that Mozilla has enabled this sort of integration into their browser. Not only Pocket, but other proprietary or privacy invasive plugins and extensions also, such as "sponsored tiles" (which is finally removed), "encrypted media extensions", and "Hello" (which I haven't figured out how to disable). These sorts of things should be separate extensions or plugins that the user can install at their whim. Shipping it by default takes away freedom and choice, and it's turning the browser into a proprietary non-free software application. What ultimately bothers me about this, is that Mozilla already has bookmark synchronization support, and their sync server is Free Software, allowing you to roll your own. Pocket doesn't offer anything that Mozilla Sync doesn't. I already have a "TOREAD" bookmark folder, where I can put pages I want to read later. And it's synched across all of my devices. Mozilla pushing the 3rd party proprietary Pocket, and Debian shipping it in Iceweasel (thankfully, a bug is submitted) is a great disservice to users and a threat to software freedom. Hopefully, Pocket goes the way of sponsored tiles, and gets removed. Posted by Aaron Toponce on Saturday, January 2, 2016, at 7:20 am. Filed under Debian, Firefox, Freedom. Follow any responses to this post with its comments RSS feed. You can post a comment or trackback from your blog. For IM, Email or Microblogs, here is the Shortlink. > other proprietary or privacy invasive plugins and extensions also, such [...] "Hello"